When I read S.E. Grove's The Glass Sentence last November, I fell in love with the world building, the characters, and the plot. I was therefore very excited to see the sequel (this will be a trilogy) out so soon and so I got to it immediately. 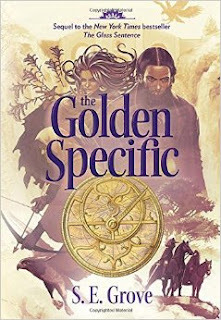 The Golden Specific picks up where TGS left off, with the main character, Sophia Tims, still trying to locate her parents -- explorers who went missing when she was a child. What complicates this is that they all live in a world where time has been fractured in different regions of the globe. The eastern seaboard of the US is in 1892 but other parts of the world are either far behind in time (the Prehistoric Snows region that would have been Canada) or are far ahead (Australia). This makes is difficult and dangerous to travel and hard to find a missing person. Luckily, Sophia has friends and the Fates on her side. I adore this series. It has diverse characters and settings, interesting alternate histories and religions, and a more complex plot than you get in many middle grade stories. Also, for being a second in a trilogy book, I was surprised to be so satisfied with the ending of this book. It, of course, left some loose ends but there were no major cliffhangers or unanswered questions. It is now just a matter of finding out HOW things work out. Book three is going to be so fun!